What is a Window Heat Pump and What is it Used For? 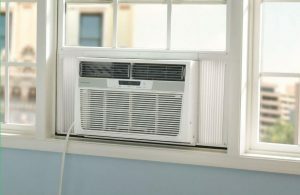 What Are The Advantages and Disadvantages of a Window Heat Pump? Window heat pumps are a wise choice for homeowners or renters who want to manage indoor temperatures without spending an arm and a leg. Despite their smaller size, they are more versatile all-around performers than furnaces or central air conditioners. A window heat pump removes heat from the air and transports it either outside (for cooling) or inside (for heating). The heat is absorbed by a liquid refrigerant that travels through a series of metal coils and it is this refrigerant that ultimately releases that heat. Even when outdoor temperatures plummet, the air still contains a certain amount of heat, which a heat pump can extract and compress into a concentrated form. Because they have both heating and cooling modes, heat pumps can eliminate the need for an air conditioner and furnace. However, this is only true in relatively small spaces, such as single bedrooms, small apartments, workshops, or garages. They don’t connect to a duct system and therefore cannot distribute air throughout a home. Window heat pumps lack the sheer power of a furnace or air conditioner. But within their range, they are just as effective. Window heat pumps harvest heat energy for import or export directly from the air. This is why they are classified as air-source heat pumps. Ground-source heat pumps use the earth as a source of heat, or as a sink for heat that has been collected from indoors. Mini-split systems combine the best qualities of a heat pump and traditional air conditioner. They cannot be technically classified as window heat pumps (the indoor unit is mounted on the wall while the compressor is installed outside). However, they are another option for people in the market for window heat pumps, since their function and performance is similar. The potency of a heat pump is measured in BTUs, or British thermal units. 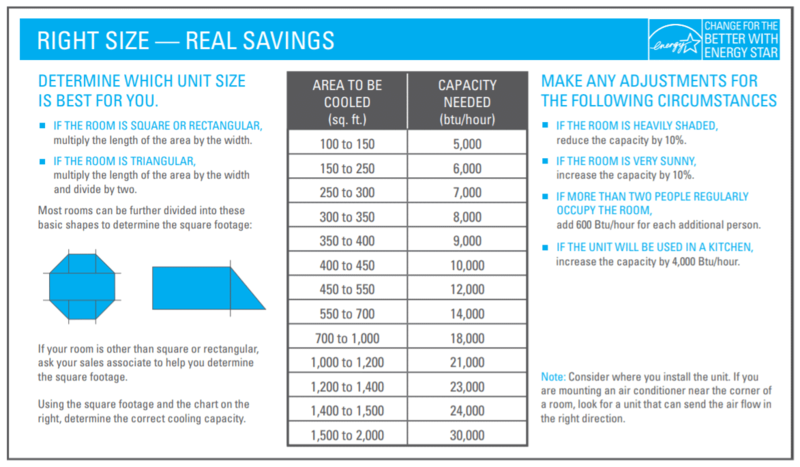 If you want to control temperatures in an area of less than 1,000 square feet, you should look for a model that offers 15,000 BTUs or less of capacity. With as little as 8,000 BTUs, your heat pump can probably manage to heat or cool an area of 350 square feet. For spaces of 1,000 square feet or more, you’ll likely need something in the 18,000 to 24,000 BTU range. Heat pumps are rated on separate scales for their heating and cooling functions. In cooling mode, a SEER (seasonal energy efficiency ratio) score of 15 or higher would be considered energy-efficient. Meanwhile, an HSPF (heating seasonal performance factor) of 9.0 or better would qualify as energy-efficient in the heating mode. Either way, the higher the number, the more energy and cost-efficient the appliance. Heat pumps powered at 115 volts can be connected to standard home electrical outlets. 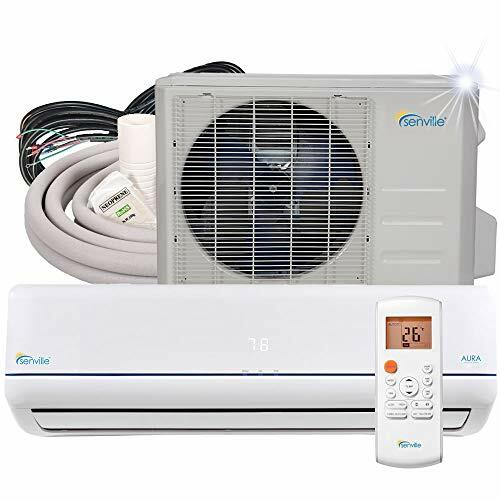 However, heat pumps of 18,000 BTUs or higher are likely to have connections in the 208-230 volt range and will require a special type of outlet. You will likely need to have one installed by an electrician if you choose a larger heat pump and that is an extra expense you should be prepared to pay. Single-hung or double-hung windows are usually required for window heat pumps. If your windows are of a different type or are too small or large to hold a heat pump, you might be able to install one in a wall sleeve built for that purpose. Your other option is to purchase a mini-split heat pump and air conditioner. With this technology, the compressor is installed outdoors while the indoor air handler is mounted on the wall. Pipes are inserted through small holes in the wall to connect the two halves of the system. Window heat pumps are widely available but enormously variant in quality. Consequently, you won’t be sure what the best appliances are unless you seek out expert opinions. Checking in at a solid 12,000 BTUs, the Pioneer WYS012-17 offers an impressive package of heating and cooling technology that is unmatched in its performance capabilities. This exquisitely manufactured mini-split system is appropriate for use in a broad range of weather conditions. 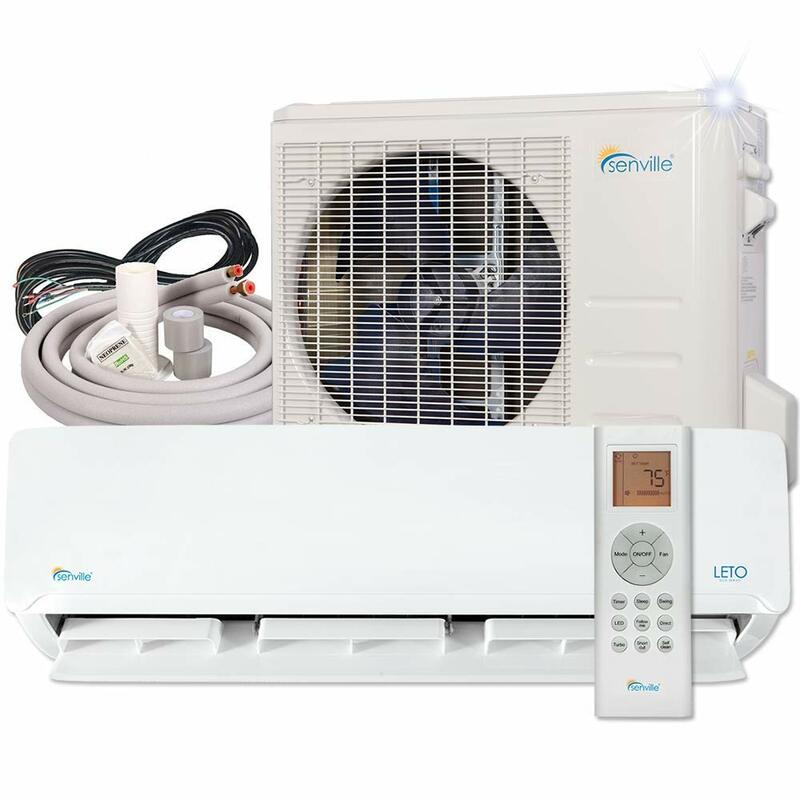 It includes a ductless indoor section for easy wall mounting, an outdoor heat pump featuring a high-efficiency inverter/compressor, an LCD wireless remote, and a 16’ installation kit. While it is not actually a window heat pump, the Pioneer WYS012-17 mini-split system gives you all the benefits of a window unit but with a supercharged level of performance. It provides incredible versatility, with dehumidification and ventilation modes in addition to its heating and cooling functions. Controllable from across the room, across town, or even across the planet, the Pioneer WYS012-17 lets you accurately manage the temperatures in your home seven days a week, 24 hours per day. Relatively Lightweight for a Window A/C at 88.4 Lbs. Window air conditioners don’t come in a more dynamic package than this latest entry in the HVAC field from Koldfront. Built to heat or cool smaller spaces in the 450-550 square-foot range, the Koldfront WAC1200 performs smoothly and effortlessly in summer, winter, and every time in between. Control options for this appliance are plentiful and function impeccably, giving users the ability to determine room or area temperatures down to a fraction of a degree. The Koldfront WAC1200 sets a formidable standard in the smaller-space heating and cooling category. It offers a plethora of programming options for advanced adaptability, maintaining a desirable temperature level on a daily, nightly, and four-seasons basis. It is quick and easy to install and well within the budget of the average homeowner or renter. The Koldfront WAC1200 combines precise performance with versatility, making it a winner in the window AC/heat pump category. As a testament to the wonders of smart technology, the Frigidaire FFRH0822R1 has few peers in the climate modification category. It is fully controllable by touch or remote control, with bright digital displays to help you keep track of its functioning. 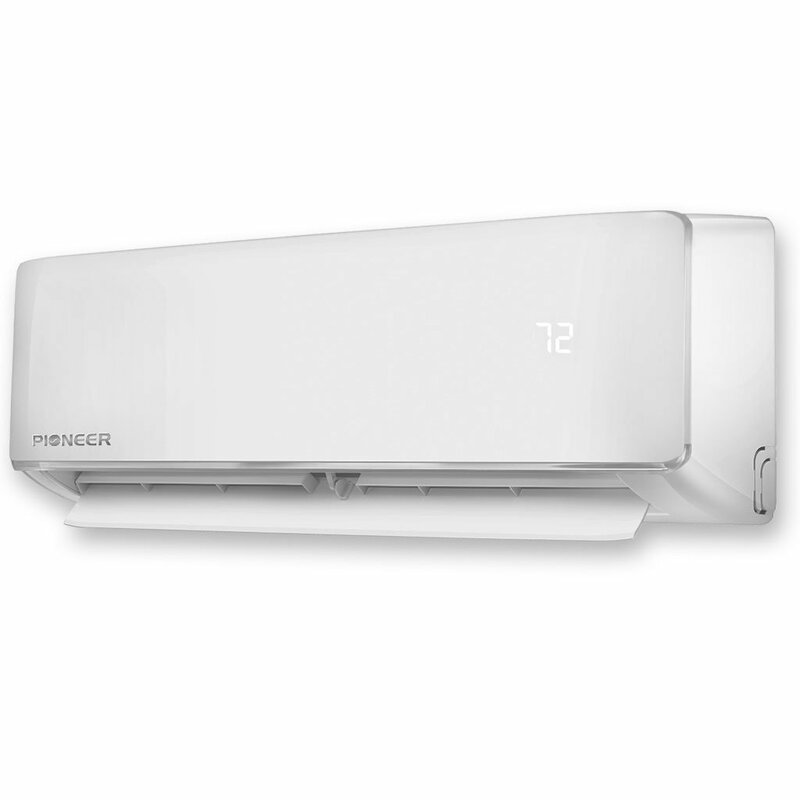 This air conditioner/heat pump comes with a slide-out chassis that makes it suitable for window or wall installation. 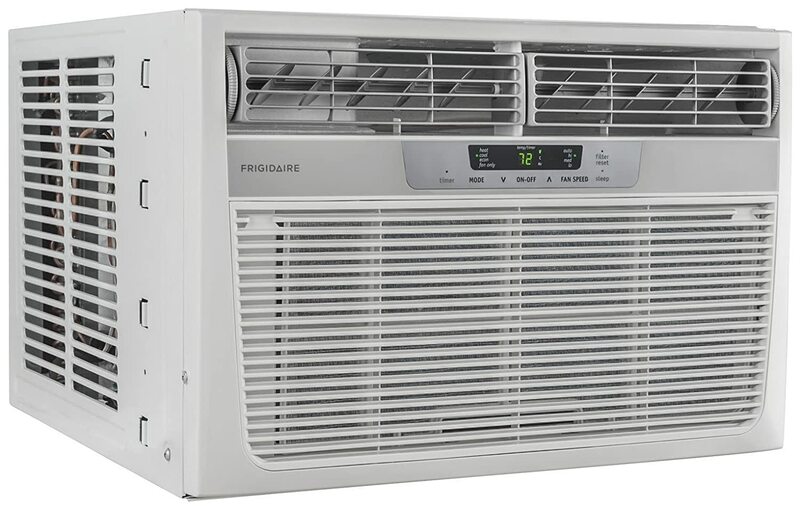 Built to heat or cool a 350-square foot area, the Frigidaire FFRH0822R1 features 8,000 BTUs of cooling and 7,000 BTUs of heating capacity. However, the latter is amply boosted by a 3,500 BTU supplemental heating system. 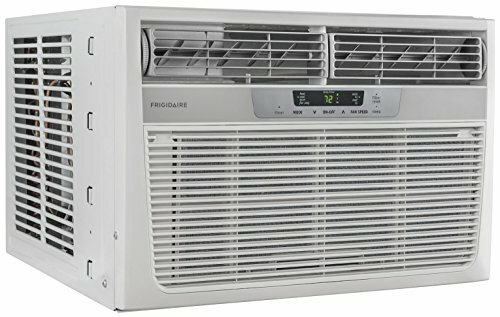 The Frigidaire FFRH0822R1 doesn’t have the power or range of some other models. But for sheer operating efficiency, it is a best-in-class entry all the way. The additional heating capacity gives it a cold-weather utility that other heat pumps may lack and its multitude of programming options guarantee customized comfort all year round. Your friends and family will flock to the room where the Frigidaire FFRH0822R1 is installed, which says it all about the effectiveness of this reliable appliance. Lightweight Package Mini-Split Package at Just 66.1 Lbs. This highly-efficient mini-split system from Senville is a cut above most of the competition. Its efficiency ratings in both cooling and heating modes are top-end and it is intricately adjustable for both cooling/heating strength and direction of airflow. The Senville SENL-12CD 12,000 BTU Mini-Split is an outstanding entry in Senville’s LETO Series, which is acclaimed for its professional manufacturing and cost-efficient functioning. Users almost universally praise the day-to-day performance of this device. It is effective in winter all the way down to freezing, while producing excellent cooling results even during the dog days of July and August. Using the Senville SENL-12CD 12,000 BTU Mini-Split is a nearly effortless affair, since every aspect of its functioning and programming can be controlled or monitored through its hand-held remote. While it is more costly than some models, in the HVAC industry you get what you pay for, as this entry from Senville’s LETO Series so aptly proves. With a heating and cooling range of up to 1,000 square feet, the Senville 18,000 BTU SENA-18HF/Z is an ideal choice for heating small homes or entire floors in larger homes. This mini-split system is a high-efficiency offering from Senville’s Aura Series, which, as a group, carries the ENERGY STAR seal of approval. Steady and quiet operation are the calling cards of the Senville 18,000 BTU SENA-18HF/Z, and this model is both easy to install and program. The Senville 18,000 BTU SENA-18HF/Z is a wonderful choice for those who prefer whisper-quiet operation plus comprehensive remote programmability. At 18,000 BTUs, it is a potent heater and cooler and will work in wintertime conditions that can cause stress on less robust heat pumps with smaller capacities. The Senville Aura Series is noted for its superior energy-efficiency, and if you are worried about high utility bills this is one mini-split system that will keep your costs down. 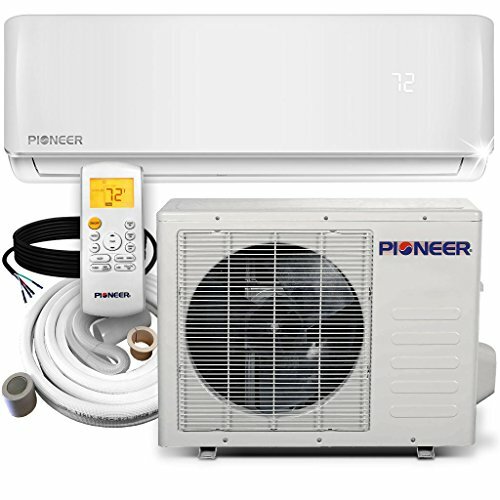 If you’re looking for a heat pump that can handle the load in a medium-sized house or large apartment, this mega-pump from the fine folks at Pioneer can certainly do the trick. At 24,000 BTUs, the Pioneer Mini-Split Air Conditioner and Heat Pump is ready for any challenge 12 months out of the year. Rated to perform at up to 1,500 square feet, this mini-split system will knock it out of the park time after time. Its energy-efficiency ratings are 16 SEER for the cooling cycle and 9.0 HSPF in heating mode, putting it in the upper echelon as a bank account preserver. 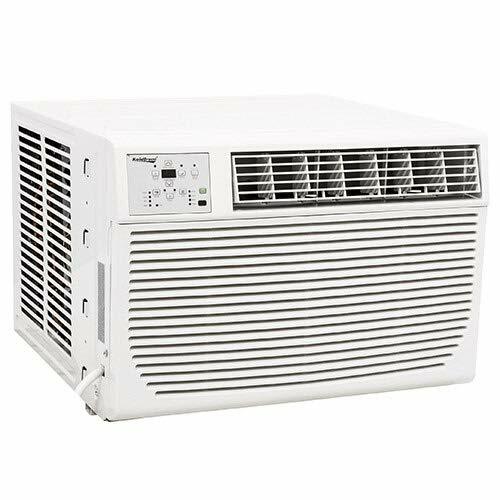 When you need consistently effective temperature control in an expansive space, the Pioneer 24,000 BTU Mini-Split Air Conditioner and Heat Pump can deliver the goods—and then some. The wireless infrared remote control puts the user in total command of this well-crafted mini-split system, providing exact temperature control plus ventilation and dehumidification as required. An impressive entry in Pioneer’s WYS Series, this unit is the perfect choice for those who need a power-packed heating and cooling system. Window heat pumps generally cost well under $1,000, yet they can still operate efficiently and effectively in both heating and cooling modes. They can eliminate the need for separate air conditioning and heating systems and do not require ductwork to deliver heated or cooled air. In addition to their temperature-controlling capacities, they can also function as dehumidifiers or as fans for ventilation. The main problem with a heat pump is that they are far more efficient in cooling mode than in heating mode. If you live in an area where winter-time temperatures drop below freezing, you’ll need a back-up heating system of some kind to support your window heat pump. While window heat pumps are an excellent choice for smaller spaces, most aren’t suitable for large apartments or entire floors of homes. In most cases, you’ll have to choose a mini-split system for that. They can be a fantastic option, however, if you already have a furnace or air conditioner but need some supplemental heating or cooling in certain rooms or spaces. 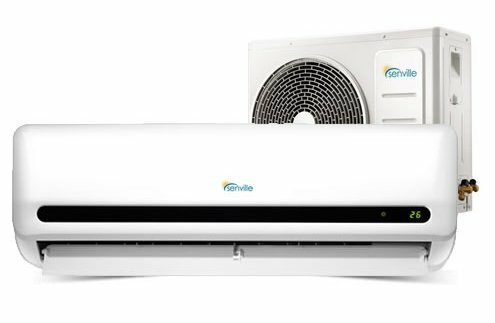 The window heat pumps and mini-split heat pump/air conditioners we’ve reviewed are high-quality performers. They can effectively heat and cool your home for a reasonable cost. Consequently, you can’t go wrong with any of them. There are no bad choices here. But you should purchase the heat pump that best fits your budget, your home or apartment size, and your personal home comfort preferences. The choice is yours, and as long as it is an educated one, you won’t come away disappointed. Heat pumps literally pump heat from the air. Outdoor air in wintertime contains a limited quantity of heat, forcing the heat pump to compress it into concentrated form before it is hot enough for indoor heating. Can You Run a Heat Pump in Cold Weather? Heat pumps work exceptionally well in cool weather. This covers a range of temperatures down to a few degrees above freezing (35-40 degrees Fahrenheit). However, as temperatures plunge, a heat pump will quickly lose efficiency. At this point, you’ll have to rely on a back-up furnace or heating element to get the job done.